From Occupy to Spotify, Zachary Kaplan talks to author and activist Astra Taylor about democracy, digital technology, and why no one claims to be a neoliberal. Zachary Kaplan: Perhaps oddly for this Data issue of DIS, I wanted to start “offline” at Occupy Wall Street. (As an Angeleno at the time, however, I felt it as a very networked experience.) That moment is starting to feel under-historicized, as if it’s floating away. 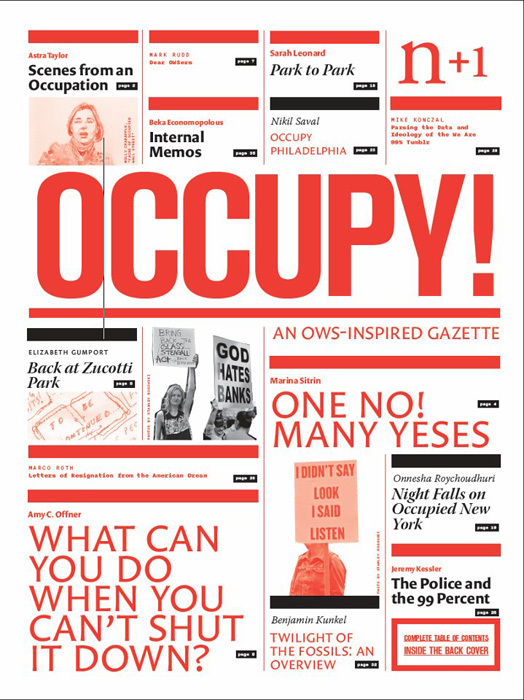 I know that you were very involved; you edited the print Occupy Gazette. 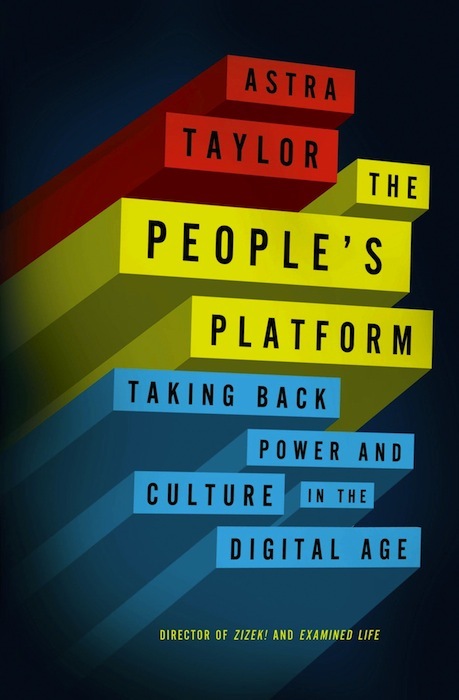 And the way you use the word “people” in your book, The People’s Platform, seems to be mining that history in response to networks effects: unequal distribution of profits, the plight of the artist among “disruptive” markets. You’re talking about “people” in a public sense, in a “how do you constitute the people?” sense, in an Occupy sense. How do you see your book and Occupy bumping up against each other? Astra Taylor: I wouldn’t have thought of the title without Occupy—I don’t think it would have resonated with me unless I’d been immersed in this subculture obsessed with the “people,” the “people’s microphone,” etc. Reviewers asked: Is this aspirational? Ironic? But, it’s homage to that experience. But let’s note that it’s amazing we’re even talking about Occupy in February 2015. I assumed that in the pattern of history it would flower, burn out, and be scorned. I think you’re right that the history is kind of drifting away, but at the same time, it’s not regarded as a joke. It’s regarded as a serious intervention. And it’s looked at much more sympathetically than I expected, especially given some of its foibles and shortcomings and ridiculousness. So I was already working on the book when Occupy happened, which intensified my own sense that inequality had to be front and center in political thought. But I actually put the book on hold, becoming the passionate editor of the Gazette, and a passionate spectator and actor in the movement. AT: Yeah, it’s a complicated word. I’d go to a tech conference and guys like Clay Shirky and Yochai Benkler would invoke “democracy” over and over without any critical sense, as though it was self-evident. They disconnected the term from cultural, political, and economic spheres. But then with Occupy the word was also invoked as though it was self-evident. “This is what democracy looks like.” “Democracy” was us in our General Assembly making decisions together with, supposedly, no mediation. In both cases, there were, of course, very undemocratic effects. There is the tyranny of structurelessness: who can dominate, who can be left out, who can participate, who can be heard? I tried to do exactly what you say: address democracy without totally defining it. After the book, I realized that this is a question I’m interested in dealing with next, and so I’ve begun a new documentary project explicitly about its challenges, called What is Democracy? In a way, it asks how can Obama, Erdoğan, Occupy, Shirky, Bush, and so on all invoke this term with equal claim. Of course the tech pundits and Occupy were both right that our political structures are totally corrupted and sold-out and anti-democratic. At Occupy, I’m not sure that we necessarily knew how to do democracy any better, or that this “beloved community of the heart” really was the example of the society we would want to build. Those pontificating commentators were right that the traditional pre-internet media landscape was horrible, that the gatekeepers and record labels and old-media giants were oppressive. But their vision of what those institutions would be replaced with—this networked, Silicon Valley, peer production, and thoroughly commercialized advertiser-driven culture—was also really anti-democratic in ways that they were likely to ignore. AT: In general I like Morozov’s work. But I wasn’t a fan of the review, and my response to his point is that I wanted to write a Marxist political economy without ever framing it directly as such. As for “neoliberalism,” the signaling that that language makes is so specific and insider and academic that I didn’t want to use it. This was a very conscious effort on my part because I wanted the book to be adopted at various levels—by schools, by activists, by all sorts of people—and partly because I think these stock phrases sometimes aren’t as useful as we think. “Neoliberalism,” in particular, has problems because it’s not a word anyone invokes positively. No one says: “As a neoliberal…” It’s a concept only critics use, which means it never pierces the target, because you’re not attacking an identity anyone credibly holds. I also worry it opens the door for nostalgia for liberalism. I am as nostalgic as anyone for “Big Society” programs, high union density, and so on, but the term neoliberalism risks letting capitalism off the hook. And capitalism is the deeper problem. Why would I use “neoliberalism” as a shortcut in my writing when I can take the time to describe actual social conditions and how they are experienced? Why not identify the precarity people feel in a world where public goods like education and retirement are individually debt-financed, the pressure to embrace a kind of entrepreneurialism and self-branding is so high, and we act as speculators looking for a return on self-investment (in our education, in our social networks, in our creativity) in order survive? The book is very much about neoliberalism, even if I never use the word. I’ve noticed that the writers on tech that I like the most happen to be women, and they don’t write the generalist, over-the-top, techno-utopian/techno-skeptic rants where you might find words like “democracy” or “neoliberalism” or “revolution” a lot. They tend to be subtler and have a field of expertise through which they understand questions of how technology is changing things and what’s at stake. Gabriella Coleman, Rebecca MacKinnon, Danielle Citron, Joanne McNeil, Zeynep Tufekci, there are so many who bring expertise, subtlety, useful data, and, crucially, history, and weave this into their books. ZK: In contrast to Morozov, I would characterize the conclusions of People’s Platform as managerial. You offer a sense of regulatory possibility, modeled after, for instance, France’s Lang Law, which fixes pricing for books, protecting authors and shopkeepers. These are notoriously tricky, we should note. You also advocate for this idea of sustainability by individual choice, which could be easily co-opted as consumerist choice. But you see opportunity in both approaches. AT: My editors told me again and again that I needn’t be prescriptive, but I wanted to put forth some concrete ideas because part of the main argument of the book is that we’re not at such a revolutionary moment, and continuity is as important as change. “New Media” and “Old Media” are interconnected landscapes. People are watching more mainstream “TV” than ever. We may get our news via Facebook, but so much is still from the New York Times. (I swear I read far, far less New York Times before Twitter.) New technologies amplify old media hierarchies. So if continuity is what we are dealing with, then some of the old solutions—if we want to call them that—to media consolidation, commercialism, centralization could still work, too. These are regulatory ideas, public investment in media, and so forth. Why are we throwing these away? It’s because the current ideology suggests that technology and the market shouldn’t be encumbered in any way. So you’re hearing phrases like “permission-less culture,” or even “participatory culture” and “free culture,” and those are Trojan Horses for the market, which is something “to be left alone” to do its magic. So I think a little public subsidy for journalism and the arts, for instance, would go a long way. At the end of the book, I quote Mariana Mazzucato, who wrote a long, intensive study on the role of state investment in technological innovation: how state support is responsible for touchscreens, the microchip, and, of course, the internet. The private sector appropriates the credit and takes the money. The state can be more innovative with regard to technology because it has a longer view. Failure is an option. Long-term investment is the thing. As someone smartly pointed out to me recently, no one has done a similarly rigorous analysis of the public sector’s role in culture, though there are reasons to believe the results would be similarly revelatory. The market is very risk-averse where culture is concerned; it tries, as much as possible, to secure a return on investment (which is why there are so many film prequels and sequels, for example). Properly implemented, state subsidy can create much-needed space for experimentation, and for expressive forms and diverse voices the market won’t support. But right now we have this idea that culture under the market is edgier and more pleasurable, while state-supported media is Stalinist, gray, dull. I think we flatter the market too much and need to push back. ZK: But there is tension there because one of the reasons that that long-term view can be taken with tech is because a lot of tech has, for instance, military applications. And while government support for the arts has declined, the private sector has been valorizing the “artist”—see the rise in artist residencies at tech companies. AT: I think that the framework that tech companies are using to justify that investment in culture is really interesting. The private sector is definitely making these assumptions—a friend of mine has a yearlong fellowship from a software company to stay home to be “creative.” Under what grounds are they rationalizing this? The point about the military applications is true, and I totally understand the way the cultural sphere is so complicated, and how it feels safer and more pure to have this independence from the state, even if it’s still within the market. But I don’t think that that’s enough. But this is where I get into uncomfortable territory, because in some ways my argument is a defense of institutions, it’s a defense of formalized structures that support people to take time, to be able to survive as artists, and to live comfortably as subjects who have bodies. Because of my upbringing as an anarchist unschooler and as someone involved in Occupy—which is all about denouncing the state, non-profits, and NGOs as all corrupt—that is a subtle dance for me. We need these big cultural institutions, political institutions, political associations, but how do we make them better? Asking that question reflected a kind of honesty I needed to have in the book, instead of defaulting to this idea of individuality at the margins, because we can’t just bow out of larger systems. Especially the way things are set up now, there’s no opting out. ZK: On that, I wanted to ask you about your debt work with Rolling Jubilee because it seems to be fully engaged with a kind of institution-building. You describe it as “a network of debtors who liberate debtors through mutual aid,” buying debt for pennies on the dollar to abolish it. AT: Both the book and Occupy dealt with how do you resist, where can you find power? Rolling Jubilee is a project that buys and abolishes debt on the secondary market. To date, we have abolished $33,000,000 of predatory health and education debt. 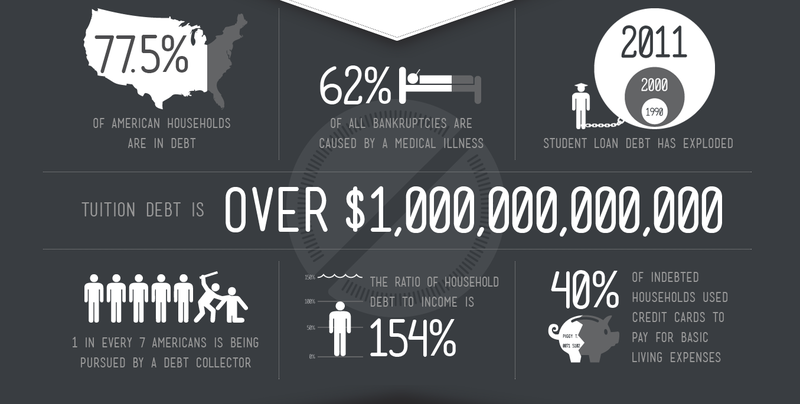 Nobody should have to go into debt because they want an education or because they get ill. This was a public education campaign to challenge the morality of the economy—the idea you have to pay your debts no matter what, even when the debts are stacked and the 1% get bailed out. It’s a continuation from Occupy, an attempt to demonstrate to people viscerally that their debts are for sale and that people are profiting off their misfortune. But the bigger goal was to try to transition to an association of debtors, because we can’t buy and abolish all the debt that’s out there, which runs into the trillions, without this coalition. So the idea is that while it’s so nice to send these beautiful letters that say, “you no longer owe debt,” this is not something we have the capacity to do effectively forever. You need to build a larger coalition. You need to organize and build power. ZK: The organization of debt is just inscrutable—as an individual owing money for a mortgage, for a student loan, you just come into contact with these enormous, faceless entities that seemingly operate beyond description. AT: The pressure on the individual right now is immense. You need to self-speculate—so education is an investment to get a job to pay off the loans for that education, instead of a space to explore interests, to participate in self-rule, to be a citizen. The way it is for artists—to be on your own, to build your brand—has become paradigmatic for everyone else. Everyone’s told to do it. Now you’re this isolated figure, and yet underneath you are all these systems—some new, some old—still extracting profit. So let’s say you’re an individual musician. The problem is all the capital is flowing to areas of distribution. All the risk is on the artist, who is doing the hard and costly work of production, while companies like Spotify or Google Music or iTunes occupy the lucrative and safe position of distribution where profits are guaranteed. How do you as a musician, or creative person, respond to that position, when there is no one to really protest, no record executive anymore, just the faraway people at Spotify or Google who don’t answer your phone call because they are not really answerable to you? Debt is similar. Wages have stagnated since the 60s, so people are going into debt for basic necessities. If we go back to mid-20th century, you would have joined a union to negotiate with your boss. Now, you’re a freelancer. Now, you’re between jobs. Now, you’re highly indebted. (We are always updating our statistics. Average student debt was something like $27,000 when we started, and now it’s like $33,000.) Who do you protest? You’re in this weird network where the people profiting are so distant from you. How do you even build solidarity among all these isolated individuals, get them to see how their life is shaped by class and financial exploitation? This is not new. I went to graduate school when I was 19 in 1999, and there was a lot of conversation about “neoliberalism” and labor, the rise of precarity, and this critique would be made again and again. We’re entrepreneurs of the self, etc. But there were never examples of the people constituting themselves in relation to this new alignment. Now, I think there are some interesting examples of people banding together and finding weaknesses in the systems. ZK: So where are people being constituted, and what leverages are they finding? AT: On the cultural workers front, as an example, there is the Content Creators Coalition. What they are trying to do is reframe the entire argument around those digital music platforms. Internet commentators have long focused on the evil record labels, the evil RIAA, and copyright as an oppressive structure. So the CCC say, “No. The problem is actually the platforms that are taking 30% just for distributing bits. And for all of their talk about transparency, they’re completely opaque.” To be involved with Spotify and Google’s Music Key is to sign nondisclosure agreements, to not be able to communicate with fellow musicians. Also, the CCC is revealing the ways the old structures like the “Big 3” record labels were actually cooperating with these new digital platforms to carry over their exploitative practices. For example, creating revenue streams among Google and Spotify and the major record labels that are not technically royalties and so don’t have to be shared with artists. And then with our debt work we are transitioning from Rolling Jubilee to a new organization called the Debt Collective: the 21st Century Debtors Union. We’re trying to get people to aggregate their debt and recognize that debt might be so out of control it has become a form of financial power. If the 1% has wealth, the 99% has debt. We’re trying to get people to come together and figure out who are these entities that they’re paying month after month. Maybe it’s Sallie Mae, maybe Wells Fargo, but we want to name this distant actor and fight them. We’re doing that now with the Debt Collective’s first campaign against the predatory for-profit school Corinthian Colleges and the fraudulent debts students incurred to attend. Perhaps it’s that I’m involved with both the music issue and the debt issue, but I see them as analogous in that they are both fighting back in the network. And the thing about this network moment is that power relations can be distributed in new ways, but are still intensely asymmetrical. It’s just more abstract and distanced, and you need to do more conceptual work to figure out and to make real those potential levers of transformation. It’s not as simple as “I won’t go to work today.” You have to be more creative. This is the political challenge of our moment. ZP: I think you’re right that we are dealing with abstraction after abstraction. Every time we use a device were engaging with this piece of material technology, linked to others globally via an information network, that is then layered with all of these apps, which then reproduce their worldviews. Parsing areas of weakness and transformation feels like this impossible task. AT: I was a teenage Deleuzian, which for a while I was embarrassed of, but I was very interested in Deleuze and Guattari, and the best experience I had was reading A Thousand Plateaus with this professor Ronald Bogue in Athens, GA. And then I kind of did a backwards loop into Marxism. I was basically taught the ideas of postmodernism before modernism. But I now really like Deleuze’s “Postscript on the Societies of Control.” He does this brilliant job of describing, or rather anticipating, a networked society shaped by these powerful mediators—Facebook, Google, the ad brokers, the infrastructure owners—that we don’t see, but find ourselves controlled by and implicated within. This fits in, again, with the financial issue: the networks of financial companies—these non-employers, non-identifiable bodies—who unseen collect money with every swipe of the credit card, every monthly debt payment. So I’m getting interested in the network as a society of control. And wondering how we take power within that web. ZK: I would think that a good Silicon Valleyer, a good Shirkyite, would tell you that the key to power is in collecting big data. AT: Yeah, I do think big data holds some possibilities here. So look, again, at the musician example—on these platforms which are built on the rhetoric of artist empowerment, the artists are given no access to any of their data. You have minimal or no knowledge of your metrics no idea what percentage of their income flows to you, what the percentage of their gross revenue versus profit. Little things leak: Facebook might make public its emotional contagion experiment, but it has no duty to report on any other experiments or way it’s marshaling data to its own advantage or the advantage of those paying for special treatment. So, that’s why I think the nonprofits like CASH Music and others trying to make and distribute tools that put that information into artists and activists hands are so important. Though we also must be wary of the Silicon Valley idea that if you have all your data, you can be this empowered entrepreneur or engineer in charge of your destiny, because it’s not that simple. So we need to be aware of this information asymmetry. With debt, we need to crack the nut of not knowing where or to what entities money is owed, and with whom to negotiate. So we are playing with the idea of platforms to aggregate data and analytics related to people’s financial circumstances to collectivize people’s debt to help solve this burden. When you ask for a loan, creditors have access to your data — they see your credit score or your social history, as in “oh, you bought those shoes, or you are friends with this person, you only deserve this money at a high interest rate.” To counter this we need data in the hands of debtors, which could be used in a completely different way, to be leveraged for fairer treatment. Morozov has written about socializing data for public benefit, which I like, but I’m more thinking of data as a resource that needs to be collected, collectivized, and used to form a class identity, to be marshaled as a tool of economic justice. But, you know, when would you hear that at a tech conference? That’s just not within their frame of conversation. Instead you would see a power lecture on microfinance, or peer-to-peer lending, or Bitcoin. Nothing that means empowerment of the many over the some. Nothing that uses big data, not just for the warm and fuzzy public good, but to fight the 1% who are waging full on class war against everyone else. ZK: Distrusting our political situation, I would assume that regulations have been drawn against this kind of collectivizing collection of big data? AT: Probably. “Data for the People” is going to be difficult because rebellion under post-Fordist conditions has been effectively outlawed. This is partly because the commentators have no idea about the history of labor, and how legally difficult it is to unite and fight back. For example, they don’t think about things like United States Anti-Trust law. Here, the law is concerned with collusion and price gouging, not labor. Some lawyers I know warn that Anti-Trust limits, for instance, the ability of artists to organize against the Spotifys of the world. It does not distinguish between big and small. If you’re an “entrepreneur”—which many freelancers are, as people have LLC or S-Corp status, even if it’s just a girl and her guitar—you cannot get together in private and talk to other musicians (who are also LLCs or S-Corps) to compare checks from these various distributors, to try to share information, to try to advocate for yourselves as a group. You’re colluding. You are at risk of Anti-Trust problems. The whole system is set up so the value of data and information is controlled. The fact that Anti-Trust could be a hurdle in organizing for people is bizarre. These are the considerations when you leave the theoretical realm and actually think about constituting a people and take collective action means under the current legal conditions. In what way does the state prevent us from using digital data for more radical purposes? How do corporations protect their power by claiming what should be our data as proprietary? We haven’t really begun to account for all these obstacles. To me, these are just some of the issues we need to pay attention to.